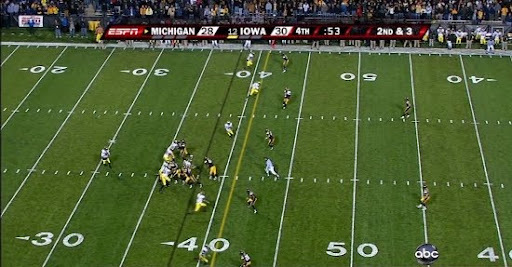 Burgeoning Wolverine Star: The Denard INT: Whose fault was it? A lot of rabblerabblerabble in the wake of Rodriguez's decision to leave Denard Robinson in the game for the final series. We all know how it ended. 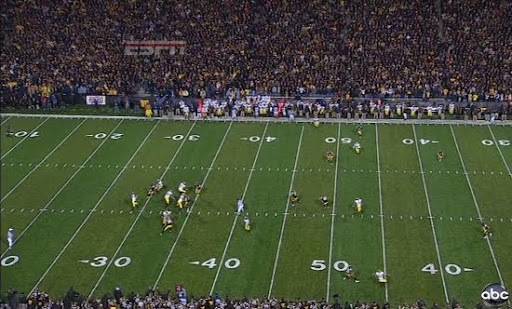 But I'm going to go out on a limb: After rewatching the play, I don't think that interception was Denard's fault. In fact, I think that interception is 100% the fault of JR Hemingway. Long story short, Hemingway read the defense wrong and broke off his route as if it were zone. 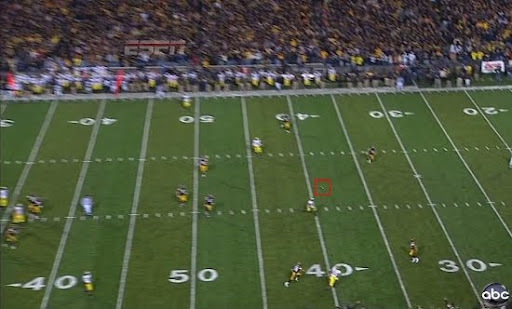 Denard read man coverage (which it was) and threw into man coverage. Now, whether or not Hemingway would've come down with the ball, or how accurate the pass would've been, I don't know, but had Hemingway run the right route, Denard doesn't throw that interception. Pictures! Here's the presnap formation. Michigan is in a five-wide set. Hemingway is the receiver on the bottom of the screen. Odoms, the only other reasonable option on this play, as we'll see, is in the slot. 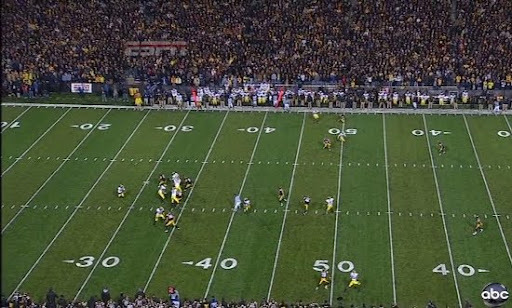 Iowa is lined up in a cover-two shell (keep everything in front of you! football) with press man coverage on all of the wide receivers. After the snap, Denard drops back and his first read is to his left (I assume that's Stonum and Matthews lined up to his left). The DBs aren't moving. They're playing press coverage and trying to get pressure with the front four, who are crossing and trying to confuse the offensive line. The O-line handles it very well and gives Denard a lot of time. 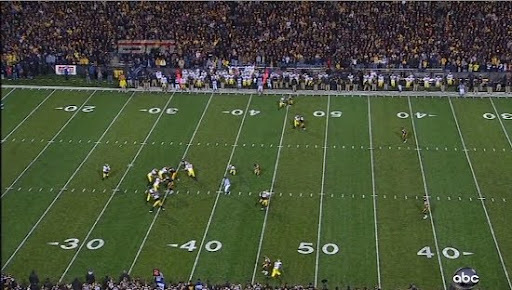 Here, you can see that Denard has passed on his two reads to his left. They're both being covered well. Odoms, who is crossing in front of the line of scrimmage (and is by the referee in the middle of the field), has broken open. He's two yards in front of his defender. If Denard throws this pass, Odoms easily gets the first down and possibly more, stopping the clock and moving the chains. My guess is that Denard doesn't seen Odoms. Odoms has gotten even more open now, but is mostly hidden behind the referee. Again, I assume that Denard doesn't see Odoms. This is where it gets interesting, though. At this point, Denard is loading up to throw the ball to Hemingway, who has gotten two steps behind his DB. The problem is, Hemingway sees the safety who is playing deep (duh, why don't we do this on 3rd and 25? ), reads him, and now thinks he's being played in a straight zone. Hemingway decides to settle down in the open part of the zone and stops where he is, but the DB is right on top of him and is playing man coverage. Hemingway stops, exactly when Denard winds up. Death. Denard has let go of the ball here. Hemingway is stopping at the bottom of the screen. At this point, he realizes that the ball is in the air and way past him. He's misread the corner who was covering him, and it's obvious that he shouldn't have broken off his route and sat down in the imaginary zone. Here, I've surrounded the ball in a red square (because the crappy program I have can't make a red circle). You can see that Hemingway is breaking after the ball, but it's way too late, as its floating into the arms of the safety. Here's where the contention comes in: Had Hemingway kept running, would this have been a great pass? I don't know. Maybe? It looks to me like it was probably a little under thrown, but even so, Hemingway could've been there to knock it down. So whose fault was it? I'm not sure, but after watching the play again, I'm inclined to say Hemingway. This reminds me a lot of the Forcier interception against ND, where Matthews blew the read and failed to sit down in the zone that Forcier threw to. It looked like Forcier just hurled the ball into a safety's chest, but the explanation is a little more comlex than that. Everyone thought that INT ended the game. This one actually did. The only way I can see this being Denard's fault is if Hemingway's route was a called comeback that Denard missed in the play calling. I find that hard to swallow though. Hemingway wouldn't have gotten behind his corner so quickly or with so much ferocity if he was going to run the comeback route. Also, he never came back. 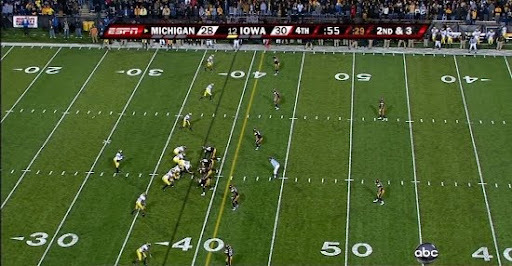 I guess it was a safer pass and maybe a better one to dump it off to Odoms--even though, given how much time was left in the game, Michigan desperately needed a pass of this length--but I honestly think that he didn't see Odoms because of their respective spriteness and the action of the defensive line. This was an unfortunate mistake, but I'm inclined to believe that it wasn't made by Denard.